Nicus Chief Evangelist Rob Mischianti deep dives into the latest features available in Nicus 5.12 and what's to come. Originally aired January 22, 2019 at 3:00pm ET. Now Available On-Demand! IT organizations at high-performing companies are backed by world-class IT budgeting and forecasting processes. 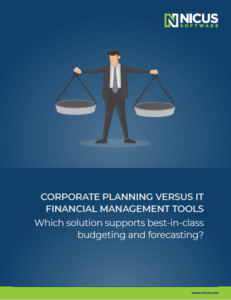 The financial teams behind these processes achieve tremendous budgeting and forecasting performance (examples include forecast accuracy within 3% variance, monthly close cycles within 2 days, monthly forecasting beyond 2 rolling years, etc.). If you're striving for "best-in-class", beware an often overlooked obstacle to success: your corporate planning tool. 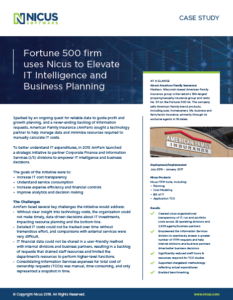 Rob Mischianti, Nicus Chief Evangelist, shares the challenges organizations face when they've outgrown Excel and need a more sophisticated ITFM tool. A former study conducted by Duke University and CFO magazine found that today’s top executives identified the difficulty of forecasting results as a major internal concern – a concern shared by leaders and managers alike. 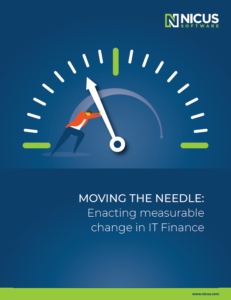 The issue for IT finance is then, how to identify the most appropriate, cost-effective resource to address the issue of visibility and forecasting, and how to use that resource to enact positive, measurable change. "The challenges faced by IT financial management are not due to poor methodology, but instead hindered by ineffective, inefficient, and outdated tools." Originally aired November 29, 2018. Duration: 30 minutes Now Available On-Demand! Like many other State and Local Government entities, City of Seattle’s Central IT was managing the IT planning process (including budgets, forecasts, and actuals) in Excel spreadsheets. The team was faced with multiple challenges including time-consuming budget adjustments, difficult data gathering, and complex and burdensome spreadsheets. 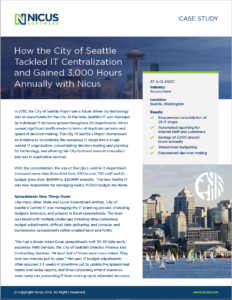 Read on to learn how the City consolidated 29 IT shops, automated reporting, and saved 3,000 hours annually. We live in a world where anyone can become data literate and access analytical tools at their fingertips. Empower ordinary users to become citizen data scientists and deliver business value by opening up your robust IT Financial Management repository. Making your data accessible will become a key part of transforming your organization and finally "running IT like a business." Originally aired October 30, 2018 Duration: 1 hour Now Available On-Demand!